About Me, Reveals How to convert a Passion Into a Web Business! About Me is Just My Story Online to Motivate You! Any story, whether it is about me or about the experiences of any person online could motivate you and other people, maybe to follow the same routes, or just to read and get inspired by others to improve the way you are doing things, living, or building businesses. It is from life itself, regardless to how different we live and where we are, we learn from each other. A person with outstanding experiences in something interests us could help us do that thing better when we read what he has written about it. An adventure with experiences absolutely benefit us in a way or another when we read what he or she wrote about his adventure and when it was about a place, we visit that place with the knowldge we have gotten to enjoy and explore it better. Experiences on things that interests us have in common requirements to fulfil what the audience want. The requirements might be on the presentation and the writing styles of such experience, or they could be on the values of the basic topics. 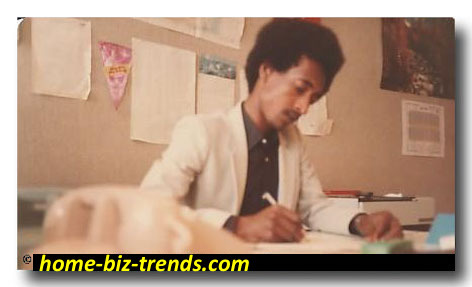 home-biz-trends.com/about-me.html - About Me: Journalist, poet and writer Khalid Mohammed Osman at his office in al-Watan Newspaper, Kuwait, 1985. Thank you for visiting this page about-me, and welcome. How to Read about Me? Don't click on any link, until you reach the link to continue this page into a second page. When you finish with the second page come here to read the pages on the other relevant links for more information and proofs. THANKS. The story in this page is simply a story about how I managed to convert all that I learned or did offline during more than 30 years, to build a small home based business online, offer with my partners consulting services, recommend trusted resources I have business relations with them and make things better to live well. 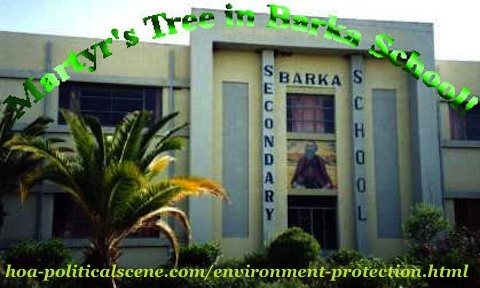 home-biz-trends.com/about-me.html - About Me: Martyr's Tree in Barka School in Asmara & many places, first phase in the environmental project I planned. We planted over 5,000,000 martyr's trees. If you thought it is simple to build a successful business on websites and blogs, read the HOME BIZ TRENDS BLOG and think again. A successful web business is neither about websites, nor about blog it. This has nothing to do with building websites and blogging, as you learn form the RSS Blogging Ezine. It has many things to do with building an online career from your own personal experiences or hobbies or other things that you enjoy and nurturing that through a system. This is what I am going to reveal through my own personal experiences with personal motivation to build, or enhance your self-ideal with great influence and help you discover your hidden power, so you can use it to make your life better. The story reveals at some points how I developed all values I acquired from my hobbies, profession and lifetime experiences to choose the best values using Choose It, study them and discover how to use them to make my life better. That means, how to build them careers on different narrow niches (but somehow relevant to each other) on the Internet. This is the best thing to learn from it... "how to" steps to do it. You and some other people have great deal of information to use to make this happen. The only thing you and they need is to study the treasure of information you all have, see if there are some other people looking for it and study how to do that building some home businesses, as explained at the Ezine Acts Home Business. Ah, information... that's what people look for when they surf for information publishing articles, for example and use the search engines to look for it. So, from this point building websites for just having a website like the others, or having a ready-made website to get rich quickly, as some affiliate Programs claim, is not the good point. What is the good point, then? I will tell you in a minute, through this information about me. home-biz-trends.com/about-me.html - About Me: The Expo Martyr's Tree in Asmara & in many places was the first phase in the environmental project I planned. We planted over 5,000,000 martyr's trees. I had been a teacher, poet, journalist and writer for along time. I started writing in my native Arabic language since the seventies. While I was a member of the first local theater group in town, I acted in some plays and wrote "The Price", as a radio play. The radio play was stolen and produced by a famous actor, playwright and producer called Abdul Wahid Abdul Allah, when I fled my country 1977-1978, as I haver been told by a friend called Mohammed Omar Abdul-Raheem, who was an active theatre artist. Even before that date, during the elementary school, teachers and classmates alike were proud of having me, as the first pupil to read in front of them a story from my mind, during the composition subject. The Arabic language teacher nicknamed me "the Sophist". So, I got the gesture of the Greek inspiration that time, elevated by the presence of the Sudanese Greek, in that peaceful society, then. See link to this Greek presence on the footnote at the bottom of the page. The teacher predicted at the same time that I will become a great writer and journalist. Some of the classmates I knew since that time still remember this story and they mention it every time we met. I did that all in Arabic, as English is not my native language. I wrote a story "about me" in a dynamic response and answer to one question in the English composition subject exam in the intermediate school. I had a dream that I was student in Paris. See link to this city on the footnote at the bottom of "about me". The story continued to touch the exciting life and of course some wonderful events that make good experiences in the French capital city, or the city of beauty and love, as we call. The Parisian adventures combined with the feeling of missing my homeland made the story sweet and delightful without having to deepen the complexity, but to explore it. Morris Leblanc inspired me, although the story was different from what he wrote. 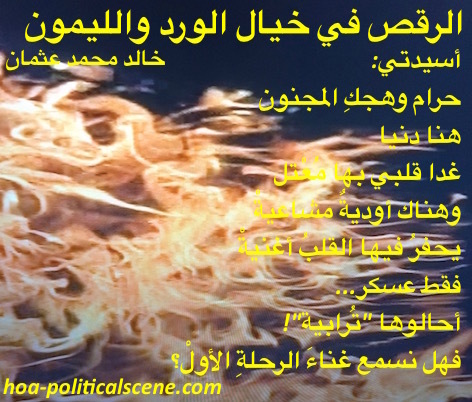 home-biz-trends.com/about-me.html - About Me: story of the burning phoenix poet & journalist Khalid Mohammed Osman burning & burning the fires of poetry & burning politics in the fires of poetry. So, the story had the top points and the teachers enjoyed talking about my imagination at the evening while they gathered in front of my father's fashion boutique (styled as Pierre Cardin's) to have the evening milk-tea. Few years later, in the secondary school, I wrote story "about me", as an assignment, in the English composition subject, I titled as "No Place Like Home". I wrote it after hearing a story broadcasted by the BBC during the 1970s, and that story struck Kevin Tabling, the volunteer English teacher who came from Britain. See the Thames here. Maybe, I touched what he was missing. But, delightfully, he said that the top points given to the story because it was the best. Feeling proud of me, he became my friend. He had a long hair as I had. You knew, that was the time of the Hippies and Beatles to continue from the 1960s, despite that the Beatles had cute style of hair. The headmaster of the school has always been angry of me because of my hair. He mentioned many times the necessity of keeping on with the orders of the school. When Kevin Tabling came to teach English in the school, the headmaster had two problems. He ordered him to cut his hear too. But, he sooner became upset, because both of us has been created disobedient. Kevin used to visit me at home to drink tea-milk at the evenings on the ground outdoors, where my friends and I used to gather to enjoy playing and chatting. He was angry of the headmaster. I told him to keep his character and defend his rights in such personal matters, calling the headmaster one of the dogmatists from the "old guard" in our society. He liked that expression. 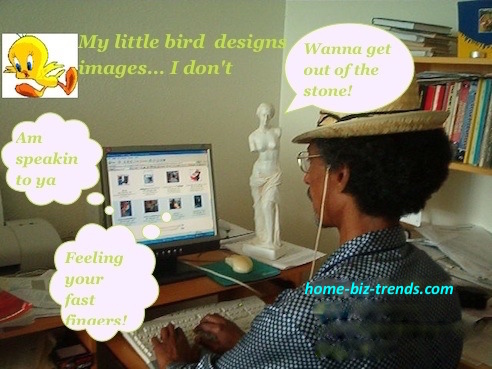 home-biz-trends.com/about-me.html - About Me: journalist Khalid Mohammed Osman getting mad at work on politics, arts, culture and literature at home biz trends blog on my computer. About Me, While Escaping Religious Dictators! I lost my appetite and abilities to use English as my favorite second language during the hard times I lived, when the Sudanese military dictators combined with the Sudanese sectarian parties created the Sudanese dictatorial systems. * See links to these political issues on the footnote at the bottom of the page. During those different and hard political circumstances, I fled my country to Iraq in the late seventieth and fled from Iraq too. I started again to flee from land to land in the Middle East and the Horn of Africa, in different times. I almost lost everything "about me" during fearful times, through which I got under ground and fled again through the borders, leaving my daughter and her mother and planning to smuggle them through the boarders. At that time, the security agents pursued my wife, asked her "about me" and confiscated her passport. They kept watching her mother's house for many months. When, they slept after that, I found a chance to smuggle her and my daughter through the borders. They both took the risk through dangerous ride among dangerous mountains in the area. 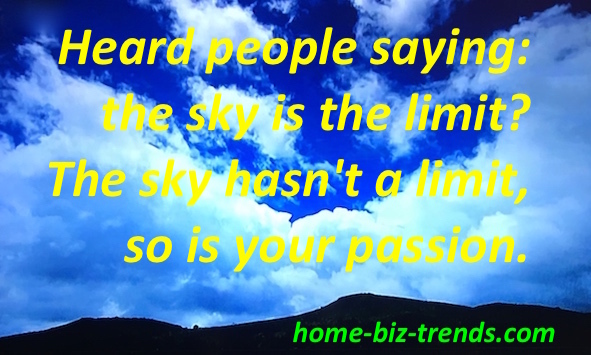 home-biz-trends.com/about-me.html - About Me: Heard people saying: the sky is the limit? The sky hasn't a limit, so is your passion. Thanks to my political strong attitudes, I built an organization, mobilized millions of people and created good understanding environment through the press. For the first time in my life, I saw a complete revolutionary society appreciating my public activities and participating in them. It took me 10 years to build this leading character and acquire the real sense of leadership. When I faced another hard situation, due to some journalistic conducts, the UN saved me from all that pain, while I was trying hard to keep the lights on through the press. They flew me to Europe to pursue working in those fields of my expertise. Here at this point, I had no choice to do this offline. There are many hard conditions and regulatory procedures that prevent many intellectuals from pursuing their lifetime careers, forget about dreams. As a teacher, I have that passion any instructor has. As a journalist, I have the sense of any reporter. As a writer, poet, and novelist I have the sense of art and prediction and the imagination to create, edit, analyze and criticize topics in many fields of knowledge, especially in politics and literature. This makes the core values in my poetry books, short story books and political books. See the right column, so you could make sure of proofs "about me". I started with a project to publish a newspaper of more values about you, not about me to bring all the knowledge I have on that newspaper, so people could learn more from it. There is no way. After 24 months working in that project, finishing it, I couldn't get the fund for the project. Instead, I become bankrupted because of some loans I got to start with something. I do not like to speak much about that experience, because it reveals bad things I again faced, even in Europe... which make me feel until this moment that there is not any kind of consideration to the human efforts or expertise at all, forget about a paradise here. The only concept that works here is that you depend on us, so accept what we want you to be, or work as we wish, or just leave. Leave? To where? Imagine if you had no country to leave to it! The only place you could leave to it would be again to Geneva. I knew, if I got to Geneva again and especially from here, then they will see that there is no big difference between this place and that place I came from it. I could not find anything that build something about me here. Luckily, I had many open chances to go online, learn more and discover many things "about me", who am I and what I could do to improve my living and my knowledge in a very conservative and so closed society. During the first months in this century, I had no clue on how to use the Internet to reflect the hidden values I acquired during my lifetime experiences. This is when I heard for the first time in my life a call to get rich quickly. Frankly, I didn't want to get rich quickly. That has never been my dream. Perhaps, I had a chance to become very rich (if I wanted to), while I was working as a reporter in one of the best newspapers in one of the five top richest countries in the world. See my journalism experiences and Khalid Osman's Network. I just wanted to live reasonably and have a good income to support a good life and help my daughter get the high education she wants. This is also why I built her the 100 Beautiful Sites in the World (See the link to the Themes above), while she studies in the university, so she could find something to rely on in her future. I couldn't build my career online without the right process and the right tools, I discovered later, just after having many experiences with those who claim quickest ways to get rich. If you used the internet since 1997, you might have heard about SmartMall, Cashevolution, WorldProfit and Clubshop. All those programs I have joined led to failures. See leads generating. I never wanted to get rich quickly, though. I only wanted to write about different topics I know about and have enough income to live and support my family, which is the simplest reason for living. In addition, I wanted to support some people in misery who came into my life while I was engaging in politics and some humanitarian activities, I now run through the Ezine Acts Humanitarian Network. I worked almost 12 hours every day during that period and could not understand the reasons those companies made to explain why I did not make anything with them. I paid many times for multilevel marketing programs (MLM) and finished with the same results. Why? Obviously, such programs don't care about me or you. I have not built anything "about me" or about anything else with them, in spite of all the time and hard efforts I put on such Ezine Acts business opportunities. At that end, I started to look for serious and honest partners in success. Then one nice day, I met a nice English small business owner from London. We still keep in touch, as he revealed to me (what I am revealing to you now) the secret of being successful on the internet. He introduced me to some people who have some success stories to learn more from them, which I did. I discovered that people only succeed, when they use what they have in their minds and hearts correct to build not only passion, but their future online. Thanks to him. I feel I should thank him for life, because he opened my mind to discover the mine of values inside me and to dig deep into it and bring these jewels / values I have acquired during my lifetime experiences to the surface / the Internet. That is what people want when they use the internet to search for information. Ah, information again? Yeh, that is the secret formula many people who seek alternatives to use the best Internet marketing strategy to build their businesses still don't see. So, I found it... yes, the secret formula included in everything about SBI. Continue about me at about SBI. Whne you finsih with the resource read Site Build It and SBI Discussion Board for more information. If you liked this page "about me" please tweet it to Twitter, pin the pictures, or share it with your services through the small buttons at the top of the navigation bar at the left, or at the bottom of the page. Thanks. Only when you complete reading the important two pages about the topic of this page, please come here again to read more information on the links above and on the footnote. Thanks. I told you these are comprehensive and unique lifetime experiences. If you have some and not using them, you could be missing something very valuable. Request Online Business Consulting Services to address this issue. Share "about me" with your social media network and the other services you see on the small buttons on the page. Thanks. Have comments about me, yourself or any including only professional information that could help others? Comments about me, or other professional individual comments appear at this section of the page on the HOME BIZ TRENDS and update and empower the website blog.